About a month or so ago, ke Akua [God] told me that He wanted me to knit an aloha prayer shawl for a friend of mine who has had a pretty rough year. 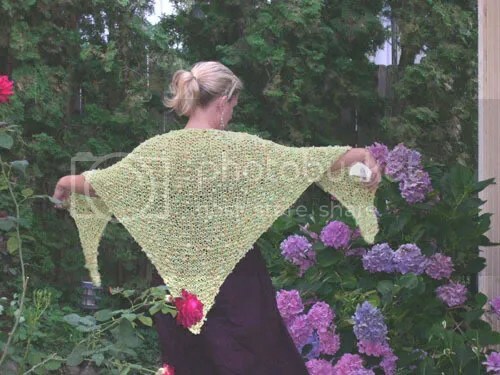 She tends to get chilly in restaurants and in the evenings during the summer, and it seemed that ke Akua wanted me to knit a shawl to take the chill off, light and summery, in colors that my friend loves. I’m on a strict yarn budget, and needed to find the yarn on sale. So I went to one of my favorite websites, Jimmy Beans Wool, and found the perfect yarn. It’s Filatura di Crosa “Orchidea”, in colorway 05, Yellow Green, on sale at half price! I started knitting, praying for my friend as I knit, and in a couple of weeks had the shawl done. My friend loved it, and it looks wonderful on her. The shades of green, orange and yellow are what she loves best. I just started a second prayer shawl for another friend who’s really going through tough times too. I like being used by ke Akua this way. If my friends can feel His love and comfort through the work of my hands, then it is a wondrous thing indeed. Prayer shawls are so awesome. I think you are doing a great job and I am sure bringing comfort to many. I think we may have to do a prayer ITEM swap. I love that you are so sensitive to HIS leading in this area. OH wow laulau…..PREETTYY. You must do one in lavendar & purple-ly. Or a black one with sparkley, be dressy doe. Or or or a white one dat matches everything…. So awesome…cause like with each stitch a prayer yeah, plenny mana dat. Lovely shawl, and what a lovely post too! That is such a lovely shawl; every time I put the small shawl you made just for my neck, I am warmed by it and by the love in it.